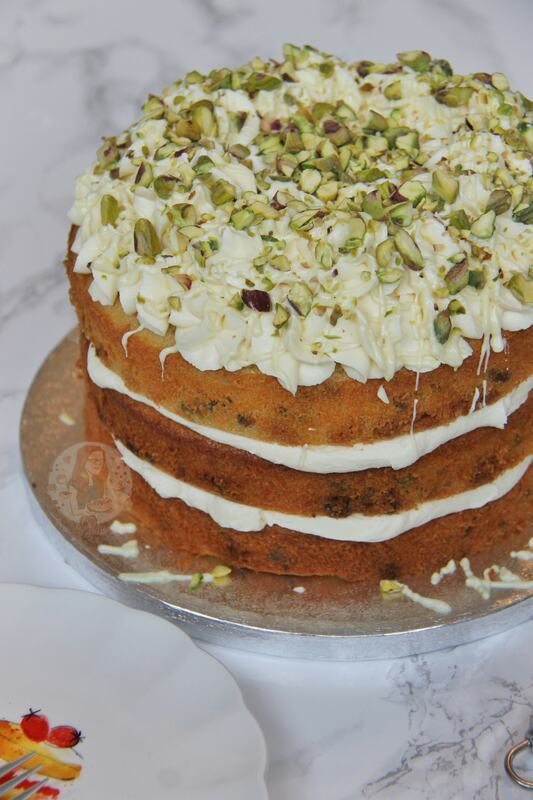 White Chocolate and Pistachio Cake! 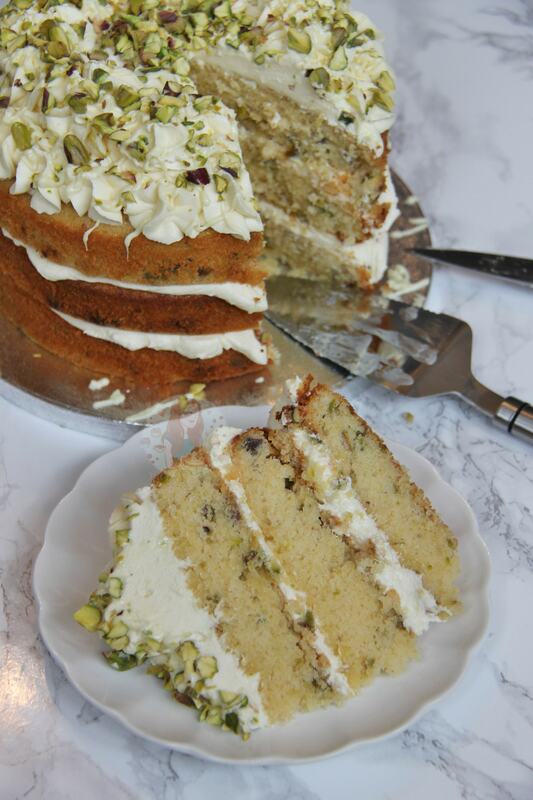 Three Layers of White Chocolate and Pistachio Sponges, with White Chocolate Buttercream, and even more Pistachio! I realised that on my blog I hadn’t put up that many actual cake recipes, more cookies and cupcakes than anything else and I felt this desperately needed sorting out! I was going through book after book to decide what cake recipe I should experiment on that would be interesting and utterly delicious.. There were so many of them I found it difficult to choose! 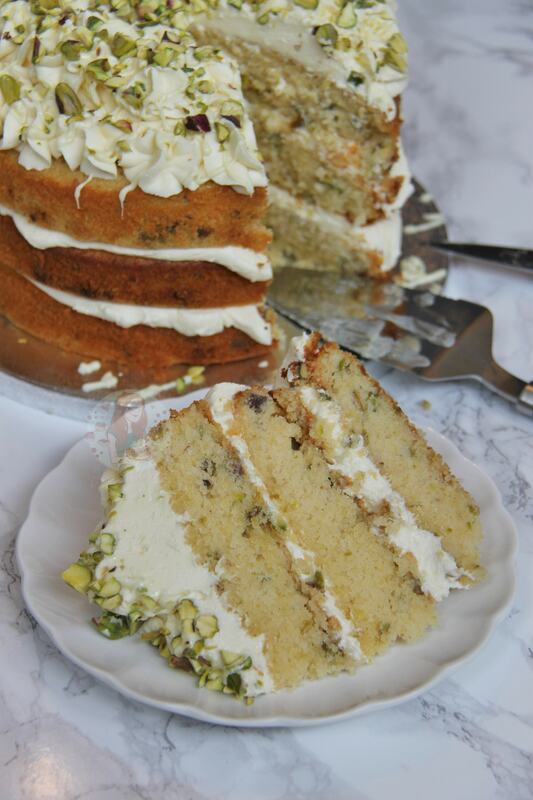 However, I did discover a recipe from the Lovely Chetna Makan from The Great British Bake Off for a Pistachio and White Chocolate cake and seeing as I have an obsession of Pistachios and chocolate that this would be ideal! You can find the original recipe here. I decided to make the cake slightly bigger to make it a celebration cake for a friend of mine – it was her birthday and I thought that it would be perfect! The cake would be ideal on a spring and summer evening for the whole family to enjoy, or especially for a dab of Afternoon Tea. This recipe serves 12-15 easily! 1) To make the Cakes – Preheat your oven to 180C/160C Fan/350F, and line and grease 3 8″/20cm cake tins! 4) Fold in the chopped pistachios and chocolate with a spatula and split amongst the tins – bake in the oven for 30-35 minutes or until a skewer comes out clean. Leave to cool in the tin for 5 minutes and then cool on a wire rack till cooled completely. 5) To make the Buttercream – Melt the chocolate in a bowl over a pan of simmer water – set aside to cool whilst you do the rest. 6) Mix the butter, sugar and vanilla in an electric mixer until light and fluffy like a normal buttercream – gradually mix in the melted white chocolate and continue to mix for about 5 minutes until its creamy and delicious. 7) Spread the icing between the layers and then pipe your buttercream using a 2D Closed Star Piping Tip on the top. Sprinkle the pistachios on top – and EAT!! You can easily take a third of the recipe away if you wanted to do only two layers, or make two thicker layers with all of this recipe – it will just take longer in the oven. 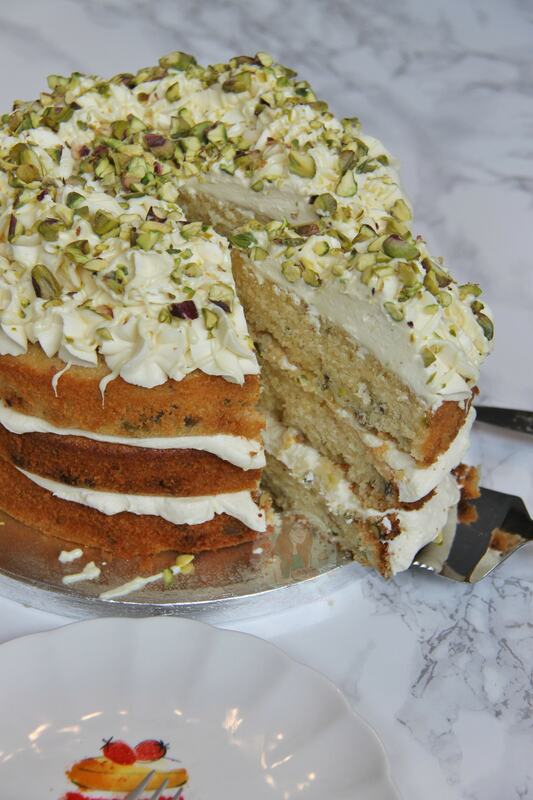 You don’t have to use the pistachios and chocolate chunks in the sponges, just use the rest of the recipe as normal, it might just take a tiny bit less time in the oven! This cake will last for 3-4 days and will stay just as delicious throughout! Older Next post: Baked Rocky Road Cheesecake! Newer Previous post: Chocolate Cupcakes! rather than 3 layers, would it work doing 2 layers in 9″ tins? Hi Jane, I just love your video “Vlog” recipes. It’s nice to watch someone creating in the kitchen and being real about it. 😊 This recipe is right up my alley, and I’m all over Caroline’s idea of adding raspberry curd between the layers… OMGodness…. How much yum factor can this cake have?! One quick question for you, could the white chocolate be melted and added to the batter rather than using solid chips? I’m not a fan of hard chips in my cakes/cupcakes. I’m just wondering if it would mess up the liquid to dry ratio or if it’s a small enough amount that it wouldn’t matter. Alternatively, Hershey’s makes a white chocolate pudding mix that could be added to the mixture instead; but again, I don’t know how that would affect the ratios. As they used to say in school, cooking is an art, baking is a science. Thanks so much for your awesome videos & recipes! You can melt the white chocolate in and fold it through the sponge mixture if you want! So I converted this to cupcakes and I’m finding them a little them a little sweet. Any ideas on something to add to make them less sweet? Is it the actual cake or the frosting? 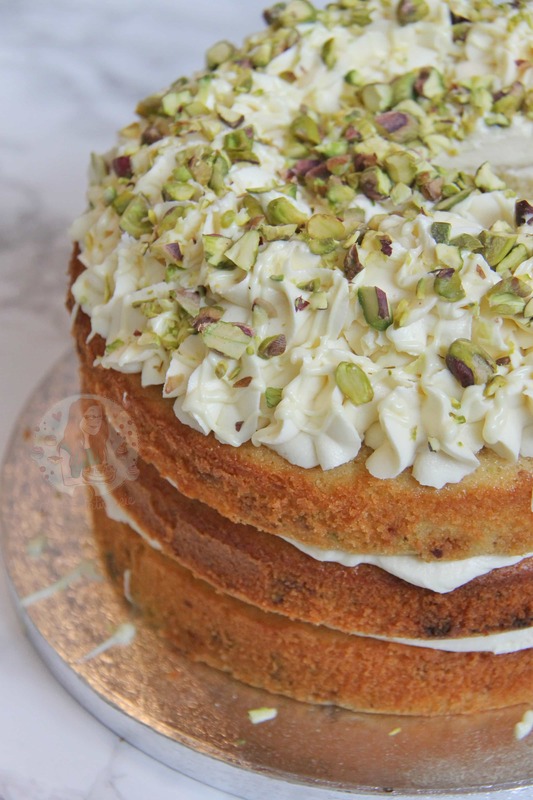 You could not add in the white chocolate to the sponge as that would easily reduce some sweetness because then its more victoria sponge style! For the frosting, you can reduce the icing sugar but that can make it taste more buttery, or use less white chocolate in it! Thanks again for all your wonderful recipes – they never fail and always taste fab! Silly question, can I use salted pistachios or do you use unsalted/roasted? Thank you for a great recipe! I made this for my dad’s 70th birthday; it looked impressive and tasted delicious! My 4 year old niece has asked a for a pink cake for her birthday. Would it be okay to add some gel colour to the sponge and the icing? You’d have to use a good quality colouring such as sugar flair which you can buy online, or progel which you can also buy online or in hobby craft for example, and it would work well. I used sugarflair food coloring and it worked so well. I made four rainbow sponge layers with pink frosting, it’s my best cake so far, delicious ans looked stunning. An absolute hit with everyone! Hi, I was wondering if this would work as cupcakes? I have your white chocolate cupcake recipe, would it work if I added some pistachios to that recipe? Would the cooking time need adjusting? The cupcake recipe would work with pistachios, it just might need a minute or two less maybe as nuts are quite drying, but it should be fine! Cake looks lovely! Could I take the pistachios out of the recipe? My daughters asked for a chocolate cake for her birthday and I want pink frosting so don’t want to do a Normal chocolate buttercream cake. Also, would I have to double the amount of white chocolate in the cake mix to account for the missing nuts? Thank you! How can I substitute self raising flour?? Use the same weight in plain flour, and add 2tsps of baking powder. Hi, can I use a fresh cream icing instead of the buttercream icing? You would have to store the cake in the fridge as cream can’t be out of the fridge for more than 4 hours, so I’d personally recommend not to. Reduce the ingredients by 1/3 and bake in two tins. Hi Jane. Cake looks lovely. How can I adjust the ingredients to make it in 3 6 inch tins? If I am completely honest, I am not too sure.. You could try taking away 1/3 or 1/4 of the ingredients? These sponges are relatively thin, so would be reasonably thick for 6″, so reducing it slightly should be perfect. Sorry for the late reply – the problem you have is that its not so simple as to use an 8″ square instead of an 8″ round as the square is considerably larger in volume.. so I would recommend 7″ squares at most unless you alter the baking times and can accept thinner sponges if you use larger ones! The cake looks amazing. What can i use as substitute for the eggs? This cake looks delicious! I’m thinking about adding a layer of curd in between the layers. Do you think a raspberry curd would work with the other flavors? Hehe thank you so much!! 😀 so tasty! that cake look beautiful and delicious! That is one beautiful cake. Wish I had been there to sample it. 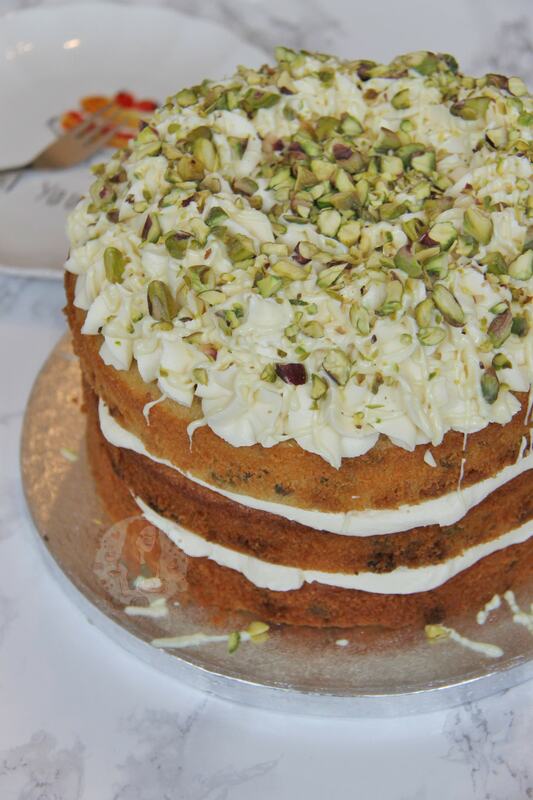 I love pistachios and the icing looks lovely. Thank you so much! I wish you had too, there is plenty to go around!! This cake is gorgeous and delicious! Love how you didn’t frost the sides so you can see all of the layers! The cake looks scrumptious. i love nuts in my cake. this looks amazing.